ServersCheck can notify you per email using either its built-in mail server or any outgoing SMTP server (using basic authentication or not). The content of the email can be customized using predefined variables. When an alert message needs to be sent, the Monitoring Software connects to our Premium Alerts Gateway to have it deliver the SMS or voice call. This requires an active Premium Alerts plan and an Internet connection. 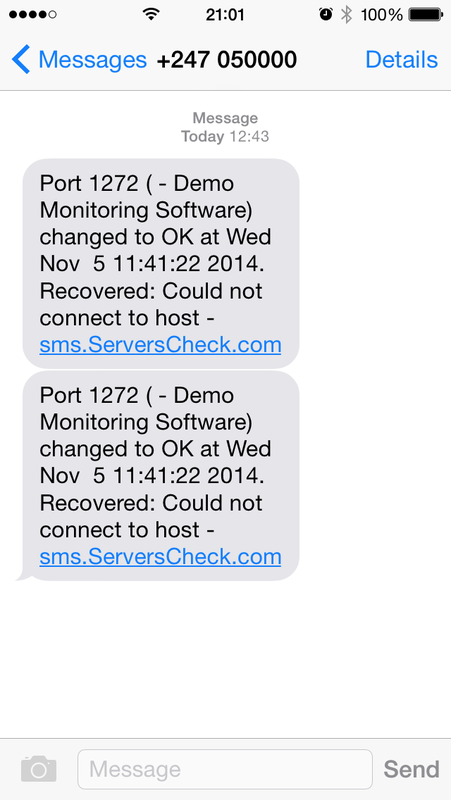 Customers having purchased a license or the appliance, can get SMS alerts over the mobile cell phone network. In the US it works with AT&T or T-Mobile. This requires an optional USB GSM modem. SMS messages will be sent to your phone via the cell phone network. Receives alerts into your Slack channel from the Monitoring Software. Businesses have become dependent on the availability of IT systems and nothing is more disturbing than having a customer or user reporting that a system failed. 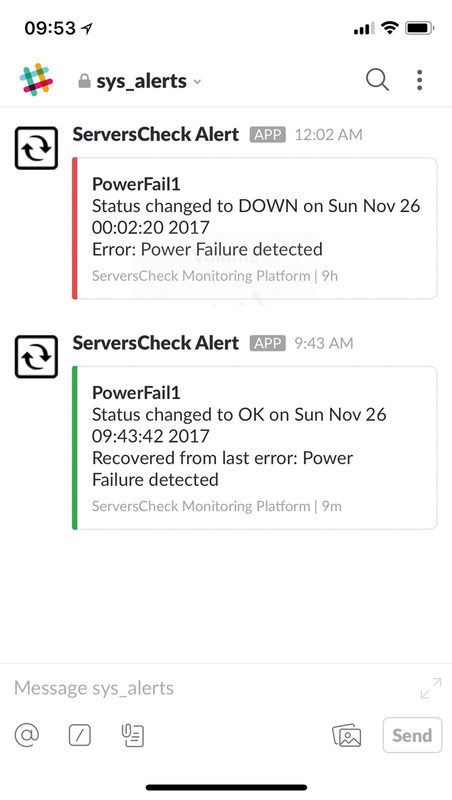 With the alerting features available in the ServersCheck network monitoring software or appliance, you will be notified automatically when a system does not perform as expected. But we go beyond the simple email alerts. You can now receive alerts via Slack so that you and your team get notifications in your preferred communication platform. Need even more than Slack & email? The software integrates with our optional Premium Alerts. This brings you SMS and voice call alerts. Using the Internet, the software connects to our messaging gateway to deliver the text message or voice call to your phone. But what if your network is down? Can you afford not getting any alerts? No! Using a USB GSM Modem connected to the software or appliance, you can get alerts via the cell phone network to your mobile.